Above: Shapeways & Etsy Sales Channel Integration/Image Credit: Shapeways, Inc.
Shapeways, a leading platform that offers products using 3D printing technologies, today announced the integration of the Etsy Sales Channel – a seamless integration for Etsy shop owners to directly manage orders and fulfilment straight from Shapeways. This services will be offer by Shapeways to its new and current customers at no charge with the start of the launch. Etsy shop owners can sign up and set up their accounts on Shapeways’ Sale Channels page here. Etsy, the popular marketplace for small businesses to sell their own products, has been a great platform for Shapeways’ customers to get their products in front of a larger audience. The integration was born from feedback by community members and will make creating, selling and shipping 3D printed items and parts easier. 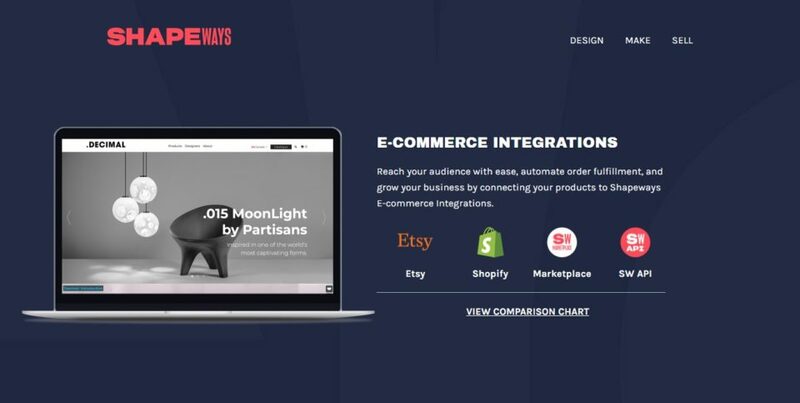 This new integration will allow shop owners to easily sync their Shapeways printed items to their Etsy shop. This enables the shop owner to automatically push their orders to Shapeways and then ship directly to customers or to their own location. With multiple choices available, shop owners can customize their delivery options to fit their needs. About Etsy: Etsy was founded in 2005 and is headquartered in Brooklyn, New York. Etsy, Inc. is the global marketplace for unique and creative goods. It is an e-commerce website focused on handmade or vintage items and supplies, as well as unique factory-manufactured items.